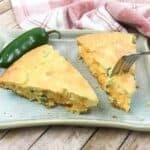 Several years ago, I had the notion to create a 3-layered Mexican Cornbread that consisted of a thick layer of cheese in between 2 layers of jalapeno cornbread. 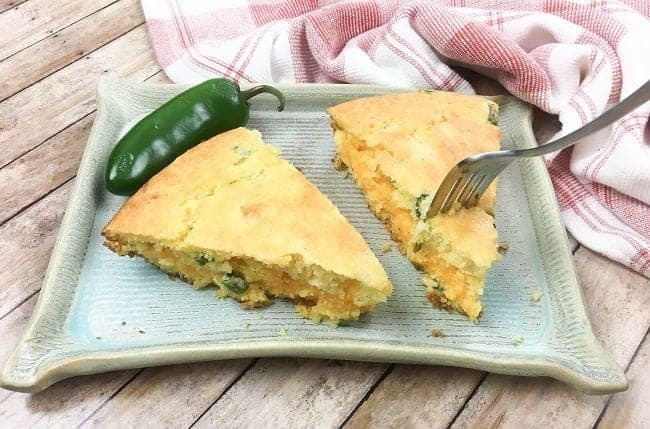 This is now our favorite way to eat cornbread! The thick layer of cheese in the middle is like a ooey gooey treat. Do you prefer to bake cornbread in a glass dish, cast iron skillet, or pie plate? This time, I used my trusty pie plate. Honestly, I’ve baked cornbread in every kind of dish, pan, and skillet out there. And sometimes I’ve used a muffin pan. I even have heart-shaped tins that I occasionally use to make my hubby smile. What Makes this Cornbread so Moist? This homemade cornbread is super moist thanks mostly to the sour cream, cream corn, and oil. Its rich and flavorful thanks to the cheese and jalapenos. This recipe uses cornmeal mix (not jiffy mix) which means the baking powder and salt are already included in the mix. 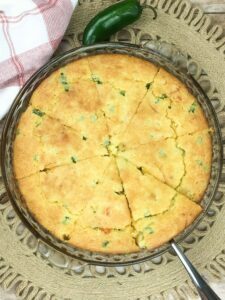 It’s actually simple and easy to make this cornbread! 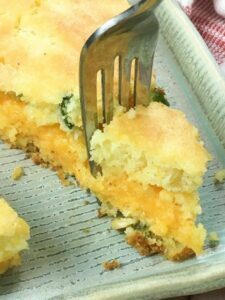 To make this layered cornbread, combine all ingredients, except the cheese, in a bowl and mix well. Pour half of the batter into a baking dish or skillet. Add the cheese on top, then add the remaining batter. Bake at 350 for about 40 minutes. This cornbread is also crazy delicious without the layers. Just mix all the ingredients, pour into a baking dish or skillet, and bake as directed. 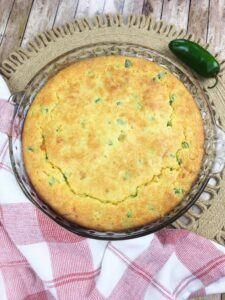 Mexican cornbread is an easy side dish that goes great with just about anything. Most people enjoy it with a bowl of chili or vegetable soup. It goes well with Red Beans and Rice with Sausage, too. Preheat oven to 350. Grease 9-inch pie plate or cast iron skillet. Layer the following in the pie plate or skillet: 1/2 cornbread mixture, all the cheese, then the remaining cornbread mixture. Do not mix the layers together. Bake uncovered for about 40 minutes or until golden brown. NOTE: If you don't want to do the layers, simply combine all the ingredients, mix well, and bake as directed. If you like this recipe let me know by leaving me a comment. I’d love to hear from you!